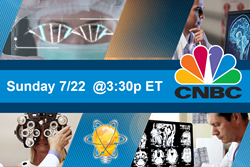 Tune in to CNBC on Sunday, 7/22 for an All New Episode of Innovations with Ed Begley, Jr.
Watch to learn about the latest advances taking place in medical technology. "Science and technology continues to alter our lives. Touching nearly every niche and industry, advances like these provide us the ability to live longer, healthier lives for years to come." Scheduled to air on Sunday, July 22, 2018 @3:30p ET via CNBC, Innovations with Ed Begley, Jr. will explore recent developments taking place in medical technology around the globe. First, Innovations will educate about advances in biological science and their subsequent impact on the medical field. Looking at AccuRna, Inc.’s (AccuRna) unique platform for nucleic acid medicine, the segment will highlight its drug delivery system (DDS) technology and resulting breakthroughs in treatment for intractable diseases. The show will also explore IRIDEX’s patented MicroPulse® Laser Technology –a tissue-sparing solution for the treatment of retinal diseases and glaucoma– as well as its latest laser, the CYCLO G6™ Glaucoma Laser. The public will learn about MicroPulse® Technology’s ability to effectively treat retinal and glaucoma conditions, while causing little or no damage to the eye. Neuspera Medical Inc. (Neuspera), a company on the forefront of bioelectronic medicine, will also be highlighted in this episode. Viewers will see how the Neuspera® Mid-Field Powering platform –which is uniquely positioned to address a broad set of debilitating conditions– is enabling some of the least invasive medical device options and is driving new approaches to proven medical treatments for chronic conditions. Committed to the continual pursuit of excellence in the physician revenue cycle management industry by delivering effective solutions through its proprietary technology, personalized service, and measurable client results, an interview with Zotec Partners will look at the complex realm of medical billing and will enlighten audiences about its impact on patients’ lives and on healthcare practices.